Construction materials for the Japanese installations on Kwajalein were delivered to the lagoon at wooden docks directly north of the center of the airfield and at a long coral-filled pier nearer the northeastern end of the island. The docks, referred to in the operation maps as Center Pier, were shaped like a wide capital H, and were accessible to boats of shallow draft only. The long pier, designated Nob Pier, almost a mile farther northeast along the lagoon shore, projected westward across the reef for some five hundred yards to reach deep water. It was shaped much like a hocky stick with a wide blade projecting at an angle from its long slender causeway. Japanese had set up a radio direction finder with auxiliary radio installations in four buildings. About 1,500 yards farther east, at the eastern end of the runway, another clearing, approximately 300 yards by 600 yards, extended along the ocean shore. It was crossed by Wallace Road, by two cross-island roads (Cox and Carl Roads), and by an antitank ditch. Commencing near the base of Center Pier and extending along the lagoon side of the island to the northeastern tip, the Japanese had constructed most of their buildings. North of the base of Nob Pier these structures filled most of the area within the loop of the highway. The beachhead line lay about 250 yards inland, along the western loop of the main island highway, which there ran north and south roughly parallel to the two Red Beaches. The shore rose just behind the beaches to an island rim a few yards wide and about ten feet above sea level. East of this higher ground as far as the beachhead line were marshy dips covered with thick underbrush. Vegetation was thickest behind Red Beach 2, in the line of the 32d Regiment advance. The northern zone, which was drier, having been shaded only by tall coconut palms more widely spaced, contained several buildings strung along an additional loop of secondary road that linked the northwest point and the highway. From the shell-pocked reef and torn-up terrain along the beach itself, the advance had to be made through debris and soft ground, both of which presented great difficulty to tanks and other vehicles. The northern boundary of the 32d Regiment's zone ran a little north of the middle of the island, from Red Beach 2 to a road junction at the western edge of Wart Area. The ocean shore on the regiment's right curved southeast, widening the area from about 275 yards at the beach to about 400 yards at the beachhead line. Within the 32d's zone the enemy defenses, referred to as Wet Strong Point, were expected to consist of pillboxes and antiaircraft gun positions, directly back of Red Beach 2, and a closely associated network of installations along the ocean shore. As the 1st Battalion, 32d Infantry, advanced after landing on Red Beach 2, it discovered the enemy defenses surprisingly weak. Although several log shelters not indicated on the operations map were met, the group of prepared firing positions at Wet Strong Point was found to be nonexistent. Moreover, very few dead Japanese were counted by the 1st Battalion as it moved toward the beachhead line with Company A on the right, Company B in the inner zone at the left, and part of Company C following in reserve. The battalion reported only light, scattered enemy resistance to its advance.2 No large pillboxes remained to be demolished. Only a few of the enemy were discovered in small underground shelters. 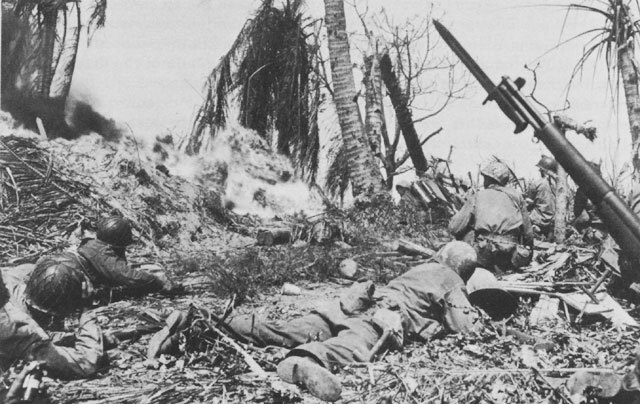 Japanese riflemen usually preferred to let the line pass, withholding fire until more profitable targets appeared. The advance platoons were at the north-south portion of Wallace Road within an hour after the landing. The rest came up more slowly, but at 1130 the battalion was at the western edge of the Wart Area clearing. Ahead of them lay a network of several pillboxes, which still contained live Japanese in spite of the heavy preliminary bombardment. These were silenced in short order in a series of almost simultaneous actions in which many varieties of weapons were used. Typical of the action at this juncture was the experience of two infantrymen of Company K, Pvt. Parvee Rasberry and Pfc. Paul Roper. 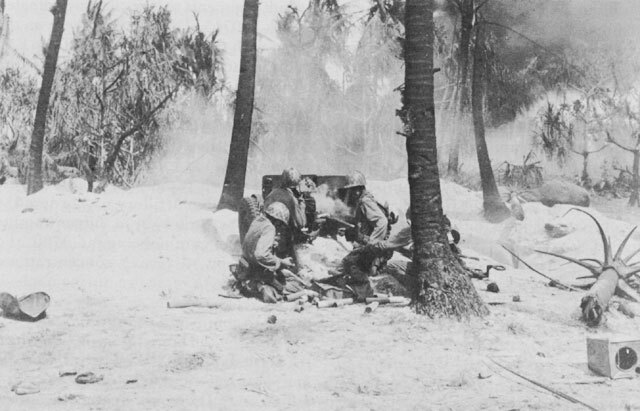 The two men had landed near the left of Red Beach 1 and had run about twenty-five yards inland when they came under fire from one of the pillboxes in the area. Quickly taking shelter in a shell hole, they started lobbing grenades at the enemy position about fifteen yards ahead. The Japanese merely threw the grenades back and the volley kept up until a flame thrower was brought forward. That, too, proved ineffective; the flames only hit the box and bounced back. Finally, Private Rasberry got out of his foxhole, crawled to within about five yards of the pillbox and threw in a white phosphorus smoke grenade. This flushed several Japanese from their cover into open positions where they could be taken under rifle fire. Those who weren't hit ran back to the pillbox. Rasberry threw white phosphorous grenades until he had none left, by which time about eight of the enemy had been killed. At this juncture, T. Sgt. Graydon Kickul of Company L was able to crawl up to the pillbox and on top of it. 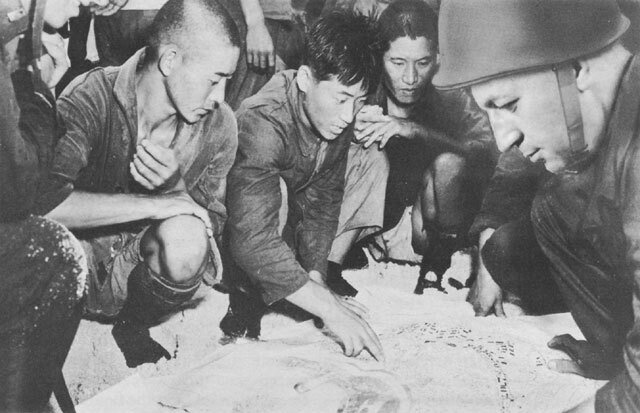 He emptied his M1 rifle into it, killing the remainder of the Japanese inside. To make doubly certain that the job was done, an amphibian tank was then brought forward to fire both its flame thrower and its 37-mm. gun into the aperture. The next objective of the two assault battalions was the line of Wilma Road, a north-south road that ran east of Wart Area and west of the landing strips, connecting Will Road on the north with the ocean-shore stretch of Wallace Road. After halting at the beachhead line, Company B furnished covering fire over Wart Area while Company A continued to advance, with Company C behind it, along the wooded ground that stretched from the clearing to the ocean shore.10 The forward company was out of communication with the battalion for over half an hour. At 1220 it was reported to be progressing against rifle and machine gun fire only, and to have pushed to a point 250 yards west of Wilma Road.11 Whistler Strong Point had proved to be unoccupied. The area east of Wilma Road contained the airfield. Two bands of wooded ground, studded with fortified positions and laced with trenches, lay along and back of the lagoon and ocean beaches on either side of the airfield. In the center of the field, between the airstrips, stretched a third wooded area about a hundred yards wide. The rest of the sector had been cleared of trees by the Japanese. Immediately east of Wilma Road was a major dispersal area, shaped much like a fishhook, curving away from the line of advance at the right to a barbed point on the regimental boundary, and broadening at the left into the western terminus of the airstrips. This terminus was a single clearing, 300 yards from north to south and 75 yards from west to east. The two airstrips--one a runway strip and the other a dispersal strip--extended eastward about 1,200 yards to another unbroken cleared area. The northern (dispersal) strip was about 50, and the southern over 100 yards wide. The boundary between the zones of the 184th and 32d Regiments had been set along the southern (runway) strip, about one fourth of the distance from its northern edge. Bombardment had shattered most of the trees not previously cleared by the Japanese from the wide area extending from Will Road on the north to Wallace Road on the south. Except for a jumble of trunks, branches, and fronds in the area between the airstrips and between the southern strip and Wallace Road, the island seemed to have become one broad clearing between coastal fringes of vegetation. Some of the enemy held out at the western end of the field as the advance battalions continued the attack and the 2d Battalion, 32d Infantry, moved forward to pass through the 1st Battalion.17 No firm defensive position commanding the entire width of the island had been established, however. The bulk of the defenders had simply retired eastward. Three coastal defense positions were anticipated on the ocean side along the shore. They were labeled on the operations map Worden, Canary, and Cat Strong Points.18 Worden Strong Point was believed to contain a covered artillery position for a field piece, a heavy antiaircraft gun, four machine gun emplacements, a network of rifle trenches, and some unidentified buildings. Canary Strong Point was thought to include two groups of positions, each similar to Worden and separated by over a hundred yards of brush-covered ground, in which the presence of pillboxes and connecting trenches was suspected but not definitely established. Worden was 200 yards beyond the Wilma Road line, and Canary about 800 yards farther. Four hundred and fifty yards beyond Canary was Cat Strong Point, extending along some three hundred yards of ocean shore south of the airfield's eastern end. The troops of the 32d Infantry would not reach it until the next day. At 1525, Company L, 184th Infantry, was reported to be two hundred yards east of Wilma Road, while Company I of the same regiment was at the northwestern corner of the airfield.24 On the right, Company C, 32d Infantry, had moved into the wooded panel between the airstrips, pursuing a few of the withdrawing enemy. Company B, 32d Infantry, pushed through the ruined concrete-mixing plant and the other debris at Worden Strong Point, leaving the mopping up of all bunkers to Company A. Company B then moved forward against Canary Strong Point, preceded by an artillery preparation that commenced at 1515. By 1540 friendly troops were so close to the target that artillery fire had to be discontinued. As the day's advance had entered the last stage, General Corlett and the rear echelon of his staff moved ashore to the command post on Carlson Island previously held by the advance party under General Ready.44 General Holland Smith, commanding the V Amphibious Corps, remained aboard the flagship Rocky Mount with Admiral Turner. During the day's operations the enemy had fought primarily from underground shelters and pillboxes. A few large bunkers and interconnected positions had delayed the advance until details "peeled off" to dispose of them while the remainder of the American line continued forward. Certain positions thought to have been wiped out by grenades, flame throwers, and high-explosive charges or projectiles remained quiet for hours, only to have surviving occupants recover and resume the battle by any means remaining to them. Those Japanese who fired rifles from trees or underbrush were relatively few and scattered. The organized resistance that occasionally developed in the open had provided a series of skirmishes for small details working with the tanks but had resulted in no large-scale encounters. One attack almost attained the proportions of a successful break-through in the American defenses but was not exploited by the enemy, either because of ignorance of his opportunity or because of insufficient strength. This attack was launched against the 3d Battalion, 184th Infantry, and started at about 0130.51 During a heavy rain squall in the last hour before midnight, the Japanese had moved back into positions that they had vacated in the afternoon. They had located Company L's machine guns in the course of an earlier assault, and proceeded to lay down a dense concentration of light mortar fire on the portion of Company L's line nearest to the lagoon. Three mortar shells fell directly on the heavy machine gun position, wounding several men and killing one. A light machine gun went out of operation nearby, and the remainder of the 1st Platoon, Company L, was forced into a temporary, hasty withdrawal. While some of the enemy infiltrated through this gap and struck the left of the 2d Platoon, the heavy machine gun in the center of that part of Company L's line was swung to the left and fired over the previous location of the 1st Platoon. By this fire on the Japanese flank, a machine gun was silenced and Will Road was closed to the enemy. The 3d Battalion, 184th, was to be relieved at the end of this first dismal night on Kwajalein. It had sustained casualties of 14 killed and 54 wounded for the entire period of its fighting on the island.55 The 2d Battalion of the same regiment was ordered to move through the 3d's forward positions and take up the attack. In the 32d regimental zone, the 2d Battalion was to continue in the line. Fresh troops would relieve that unit later in the morning. most of its length was in the area beyond the road. Because of the northward curve of the island, the area between the airfield and the ocean narrowed quite sharply at the end of the airfield nearest Carl Road, and the regimental boundary down the middle of the island cut diagonally across the airfield's eastern end. Near Carl Road the wider portion of the 32d's zone was thus open ground, consisting of the end of the landing strip and part of the dispersal space just north of it. The 184th Infantry's zone of advance for several hundred yards ranged from the northern edge of the landing strip to the lagoon. The central, wooded panel between airstrips was at the right; next was the dispersal strip, which curved southward at the far end; to its north was the wooded area between the airfield and Will Road; and between the road and the lagoon beach was a curving belt about seventy-five to a hundred yards wide in which, commencing in the area of Center Pier, there was a continuous series of buildings. Although bombardment and air strikes had wrecked the docks and destroyed most of the buildings and a direct hit during the naval bombardment of 30 January had sent an ammunition dump skyward with devastating results in a wide area near the base of the docks, a number of active gun positions had been spotted along the lagoon. Also, in the area near Carl Road, where the thickly wooded strip between the dispersal strip and Will Road greatly widened, some enemy resistance might be expected. 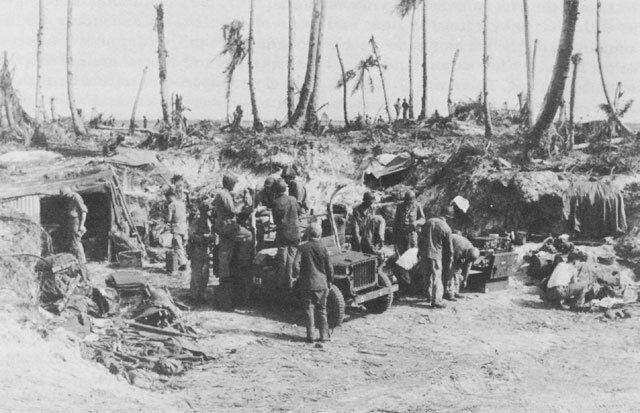 That part of Company G that was moving along the ocean shore had relatively little trouble, but the platoon on the left ran into considerable organized resistance in the form of riflemen working from trees and shallow fire trenches and of automatic fire from strongly revetted pillboxes. The positions backed up those along the ocean front, and while the latter were the more conspicuous, the former were the more deadly. It took two hours of fighting for Company G to advance two hundred yards through this belt of works with the aid of tanks and engineer demolition crews. By 0926 they had reached the end of Canary Strong Point. Upon crossing Carl Road, the two regiments began the second stage of their attack of 2 February. A section between Carl Road and Nora Road, some three hundred yards farther along the island, was to be traversed. Will Road continued to parallel the lagoon beach. Wallace Road, at a point a hundred yards beyond Carl Road, swung left away from the ocean for a hundred yards to join Nora Road, thus narrowing the distance between Will and Wallace Roads. east from Carl Road to the bend in Wallace Road; and, from the other side of the highway at that point, a shorter section extended for ninety yards south to the ocean beach. Just beyond the angle of the trap, between the long bend in Wallace Road and the ocean shore and short of the Nora Road line, lay one of the most extensive and elaborately organized sets of defensive positions on the island. Designated as Corn Strong Point, it extended inland to a depth of about a hundred yards and was believed to contain three pillboxes and an open artillery position, both near the beach, and up to seven machine gun emplacements inland. These positions were interspersed with storage pits and antitank trenches. North of the main tank trap a long rifle trench ran in an irregular line across the island diagonally from Corn Strong Point to a point near the junction of Carl Road with Will Road. The 184th Infantry had come upon its northern extremity just before reaching the Carl Road line. The trench, with a connected loop in the middle of the island, extended through most of the ground to be covered by the 184th's right elements. It was clear that the long rifle trench, the tank trap, and the associated gun emplacements of Corn Strong Point were intended to be the main defense system obstructing movement from the western part of Kwajalein Island, containing the airfield, into the northeastern portion, containing most of the installations. Along this line the Japanese were expected to make their most determined stand. For the initial assault on the tank trap and Corn Strong Point, the 32d Infantry's 3d Battalion was ordered to pass through its 2d Battalion at Carl Road and to lead the attack. These fresh troops were to be supported by the tanks of Companies A and D, 767th Tank Battalion and, from the left flank, by the tanks of Company B, which would be temporarily detached from the 184th.66 Preparatory and supporting fire from the artillery on Carlson Island and from the 32d's Cannon Company in Wart Area was to be co-ordinated with the tank and infantry movements. 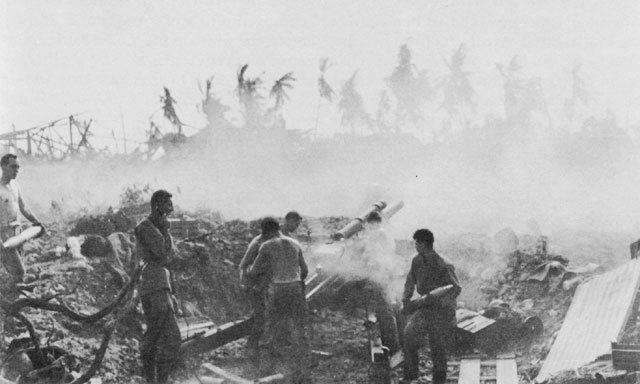 While the new assault units were moving up, the enemy in Corn Strong Point was kept under heavy artillery bombardment and was isolated from possible reinforcement by naval gunfire.67 Enemy guns that were still active in the northeastern end of the island were struck by dive bombers. The jump-off was ordered for 1245. A series of delays deferred this crucial attack over an hour. To assemble the staff and co-ordinate the plans for employing tanks, artillery, and infantry while the 3d Battalion made its approach march, proved difficult to arrange. The time for the assault had passed before the planning difficulties were resolved. Then came notice of an air strike to be made at 1315 later postponed, on Admiral Turner's order, to 1330--thus necessitating the suspension of all artillery fire.68 Since the attack on Corn Strong Point was to be immediately preceded by a heavy artillery barrage, the whole operation was postponed to 1400. While the left wing of infantry troops started to push across the wide tank barrier, the tanks on their left momentarily broke off fire from the flank. A few tanks from Company A, 767th Tank Battalion, moved toward the ocean to bypass the deep ditch, and the others after a brief hesitation laid a base of fire to cover the infantry's advance. The tanks hesitated to poke out along the flimsy wooden bridge by which Wallace Road cut through the angle of the tank trap. At this stage, a concentration of white phosphorus shells commenced to fall into the area in which Company I, 32d Infantry, was moving, and some two score of the men were burned. After hesitating briefly the infantry moved steadily to the tank ditch. 1. 7th Inf Div FLINTLOCK Rpt, Vol. II, FO 1, Opns Map; JICPOA Bull 48-44, Ju1 44, p. 1. 2. RCT 32 Jnl, 1 Feb 44, Msgs 23a, 26, 28, 33a, 36, 54a, 68; Marshall, Kwajalein Notes, Vol. I, p. 14. 3. Marshall, Kwajalein Notes, Vol. 1, pp. 10-11. 4. Ibid., Vol. I, pp. 10-13. 5. 7th Inf Div FLINTLOCK Rpt, Vol. XII, 7th Inf Div Arty Rpt, Jnl, 1 Feb 44, Msg 23. 7. 7th Inf Div FLINTLOCK Rpt, Vol. XI, RCT 184 Rpt of Opns, BLT 184-3, Chronological Rpt of Opns (hereafter cited as BLT 184-3 Rpt), p. 1. 8. RCT 184 Jnl, 011135 Feb 44, 011240 Feb 44. (All messages of the 184th Infantry's Journal are time-dated in this manner and not numbered. The first two digits represent the day of the month, the last four the time of day.) Marshall, Kwajalein Notes, Vol. 1, pp. 94-95. 9. 7th Inf Div FLINTLOCK Rpt, Vol. II, FO 2, 6 Jan 44, Opns Map, Phase II. 10. Marshall, Kwajalein Notes, Vol. I, p. 14. 11. RCT 32 Jnl, 1 Feb 44, Msg 57a. 12. Ibid., Msgs 75, 75a, 92; Marshall, Kwajalein Notes, Vol. I, pp. 15-16. 13. BLT 184-3 Rpt, p. 2. 14. RCT 184 Jnl, 011205 Feb 44, 011240 Feb 44. 15. Ibid., 011450 Feb 44. 16. Marshall, Kwajalein Notes, Vol. I, pp. 16-17. 17. RCT 32, Jnl, 1 Feb 44,Msg 104. 18. 7th Inf Div FO 2, Opns Map, Phase 11. 19. RCT 32 Jnl, 1 Feb 44, Msg 92; RCT 184 Jnl, 011442 Feb 44, 011550 Feb 44; 7th InfDiv Arty Rpt, Jnl, 1 Feb 44, Msg 99. 20. RCT 32 Jnl, Msg 82; Marshall, Kwajalein Notes, Vol. I, p. 16. 21. 7th Inf Div Arty Rpt, Jnl, 1 Feb 44, Msg 98; Marshall, Kwajalein Notes, Vol. 1, p. 95. 22. 7th Inf Div Arty Rpt, Jnl, 1 Feb 44, Msgs 95, 101. 24. BLT 184-3 Rpt, p. 2. 25. Marshall, Kwajalein Notes, Vol. 1, pp. 16-17. 27. RCT 32 Jnl, 1 Feb 44, Msg 134. 28. BLT 184-3 Rpt, p. 2; Marshall, Kwajalein Notes, Vol. 1, p. 96. 29. RCT 184 Jnl, 011745 Feb 44. 30. RCT 32 Jnl, 1 Feb 44, Msgs 134, 142a, 147b. 31. Col Claudius H.M. Roberts et al., Report on Kwajalein and Eniwetok Operations, 14 Mar 44 (hereafter cited as Roberts Report), pp. 34ff. The Roberts Mission was sent to the Marshalls to evaluate the effect of both U.S. and enemy weapons and report its findings to General Richardson. 32. 7th Inf Div Arty Rpt, Jnl, 1 Feb 44, Msgs 21, 31, 32 TF 51 Marshalls Rpt, Incl A, p. 6. 33. BLT 184-3 Rpt, 1 Feb 44, p. 1. 34. Marshall, Kwajalein Notes, Vol. 1, pp. 17-18. 36. 7th Inf Div FLINTLOCK Rpt, Vol. VII, G-4 Rpt, Annex B, p. 3; 767th Tk Bn Jnl, 1 Feb 44, pp. 4-5. 37. TF 51 Marshalls Rpt, Incl A, p. 6. 38. RCT 184 Rpt, p. 2. 39. RCT 184 Jnl, 012400 Feb 44. 40. These figures are calculated from the 7th Inf Div Arty Jnl, 1 Feb 44, Msg 134, which lists rounds expended between shorter intervals than those of the Southern Artillery Report. For 1 February 1944, the latter gives the figures for 155-mm. as 873 and for 105-mm. as 28,120 rounds between 0600 on 1 February and 0600 on 2 February 1944. 41. Marshall, Kwajalein Notes, Vol. III, p. 26. 42. 7th Inf Div Arty Rpt, Jnl, 1 Feb 44, Msgs 137, 138, and 2 Feb 44, Msg 43; 49th FA Bn AAR, p. 3. 43. TF 51 Marshalls Rpt, Incl E, App 1, p. 3. 44. 7th Inf Div FLINTLOCK Rpt, Vol. III, 7th Inf Div G-I Rpt, Annex VIII, p. 2; Ibid., Vol. VI, 7th Inf Div G-3 Jnl, 1 Feb 44, Msg 111. 45. Marshall, Kwajalein Notes, Vol. I, p. 97. 46. RCT 184 Jnl, 011800 Feb 44; Marshall, Kwajalein Notes, Vol. I, p. 18. 47. TF 51 Marshalls Rpt, Incl E, App 2, p. 8. 48. BLT 184-3 Rpt, p. 3; 7th Inf Div FLINTLOCK Rpt, Vol. IX, RCT 32 Rpt of Opns, BLT 32-2 Jn1, 012355, 020320 Feb 44. 49. RCT 32 Jnl, 1 Feb 44, Msg 149c, and 2 Feb 44, Msgs 1, 2. 50. RCT 184 Rpt, S-1 Rpt, 9 Feb 44, p. 1. 51. RCT 184 Jnl, 020137 Feb 44; Marshall, Kwajalein Notes, Vol. I, pp. 97-98. 52. 7th Inf Div Arty Rpt,Jnl, 2 Feb 44, Msg 6; BLT 184-1 Rpt, p. 4. 53. BLT 184-1 Rpt, p. 5. 54. Marshall, Kwajalein Notes, Vol. I, p. 18. 55. Ibid., Vol. 1, p. 98. 56. 7th Inf Div FLINTLOCK Rpt, Vol. II, FO 3, 1 Feb 44. 57. 7th Inf Div FLINTLOCK Rpt, Vol. XI, RCT 184 Rpt of Opns, BLT 184-2 Rpt of Opns (hereafter cited as BLT 184-2 Rpt), pp. 3-4; TF 51 Marshalls Rpt, Incl E, App 2, pp. 8-9; Marshall, Kwajalein Notes, Vol. I, pp. 98-99. 58. Marshall, Kwajalein Notes, Vol. I, p. 18. 59. Terrain description is based on operations map and aerial photographs now in files of OCMH. The description of the defenses is also based on the map and photographs as corrected by JICPOA Bull 48-44. 60. BLT 184-2 Rpt, p. 61 RCT 184 Jn1, 020732 Feb 44. 61. RCT 184 Jnl, 020816 Feb 44. 62. Marshall, Kwajalein Notes, Vol. I, p. 99. 63. BLT 184-2 Rpt, p. 4. 64. Marshall, Kwajalein Notes, Vol. I, p. 19. 65. RCT 32 Jnl, 2 Feb 44, Msgs 30, 31, 32, 33; Marshall, Kwajalein Notes, Vol. I, p. 19. 66. RCT 32 Jnl, 2 Feb 44, Msg 34a; 7th Inf Div FO 2, Opns Map, Phase 11. 67. RCT 32 Jnl, p. 121. 68. Ibid., Msgs 37, 43. 69. 7th Inf Div Arty Rpt, Jnl, 2 Feb 44, Msgs 91, 99, 100, 101, 104, 108. According to this journal, all battalions ceased fire between 1327 and 1407; however, at 1350 the 32d Infantry's journal records that the 49th Field Artillery Battalion had continued to fire during the air strike. See also Marshall, Kwajalein Notes, Vol. I, p. 20. 70. Marshall, Kwajalein Notes, Vol. I, p. 20. 71. RCT 32 Jnl, 2 Feb 44, p. 128; Marshall, Kwajalein Notes, Vol. I, p. 21. 72. Marshall, Kwajalein Notes, Vol. I, p. 21. 73. RCT 184 Jnl, 021330 Feb 44, 021831 Feb 44. 767th Tk Bn Jnl, p. 6; Marshall, Kwajalein Notes, Vol. I, p. 100. 74. BLT 184-2 Rpt, p. 4. 75. Ibid., p. 4; Marshall, Kwajalein Notes, Vol. I, p. 22. 76. TF 51 Marshalls Rpt, Incl F, p. 4. 77. Ibid., p. 109, and Incl A, p. 7. 78. 7th Inf Div FLINTLOCK Rpt, Vol. VII, G-4 Rpt, Annex C, Medical Rpt, p. 127. 79. 7th Inf Div Med Bn Rpt of Activity During FLINTLOCK Opn, 2 Feb 44, pp. 10, 11. 80. 7th Inf Div FLINTLOCK Rpt, Vol. III, G-1 Rpt Jnl, 2 Feb 44, p. 9; RCT 32 Jnl, 022030 Feb 44. 81. RCT 32 Jnl, 2 Feb 44, Msgs 71, 72. 82. Ibid., pp. 136-39; Marshall, Kwajalein Notes, Vol. I, p. 101. 83. RCT 32 Jnl, 3 Feb 44, p. 139. 84. 91st Chemical Co Rpt of Participation in Kwajalein Opns, 18 Feb 44, p. 137. 85. 145th FA Bn Jnl, 3 Feb 44, pp. 187-88; Marshall, Kwajalein Notes, Vol. III, pp. 27-29. 86. RCT 32 Jnl, 2 Feb 44, Msg 71.